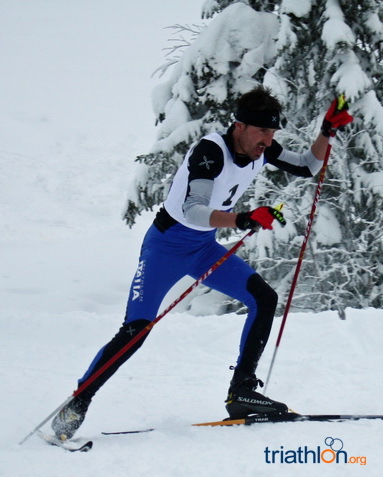 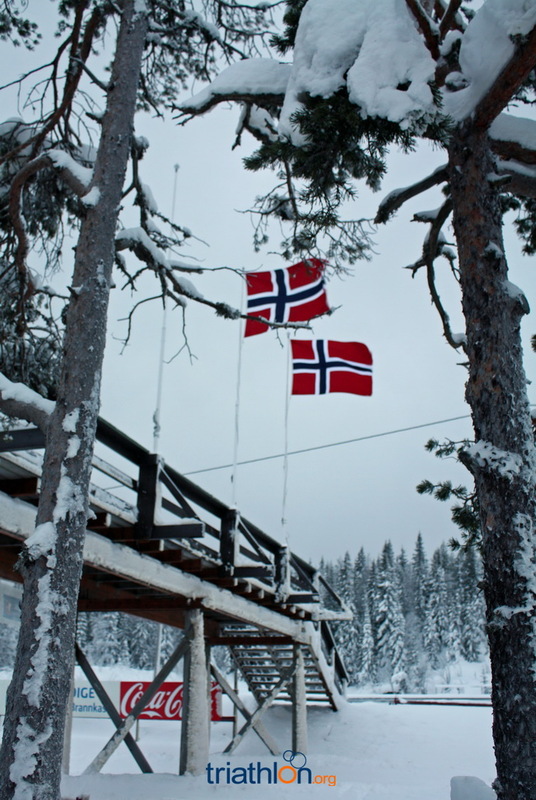 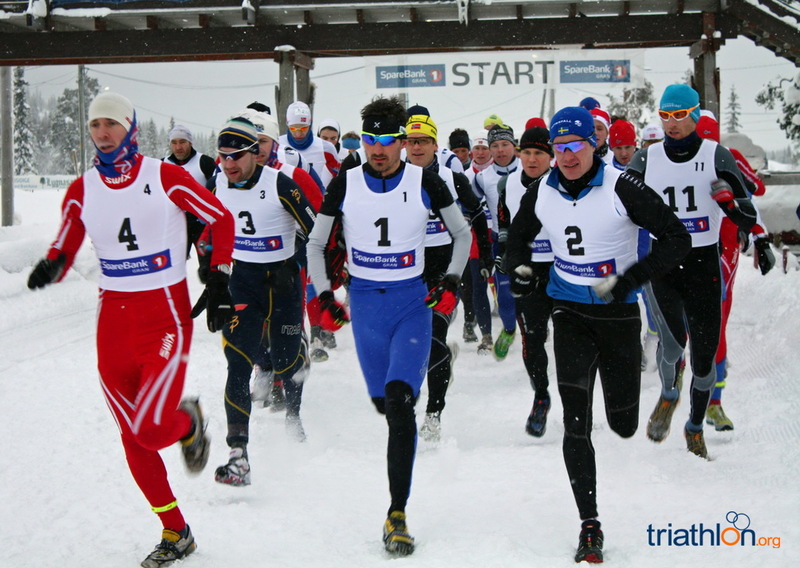 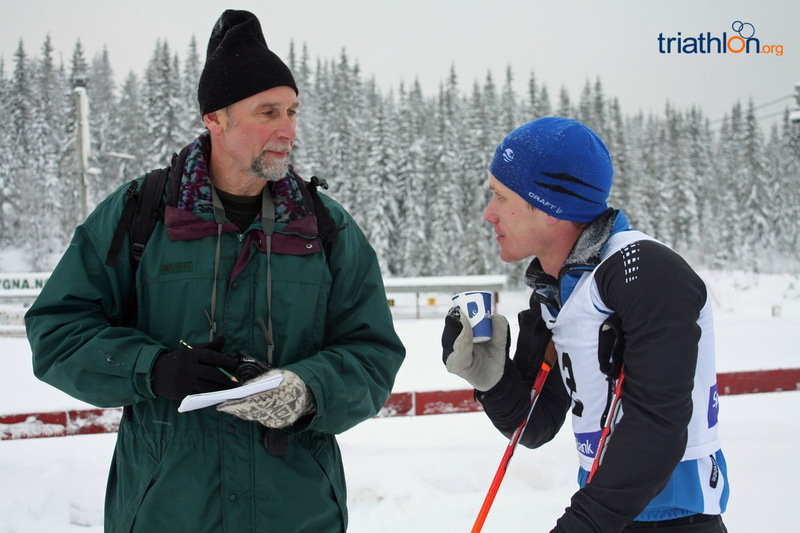 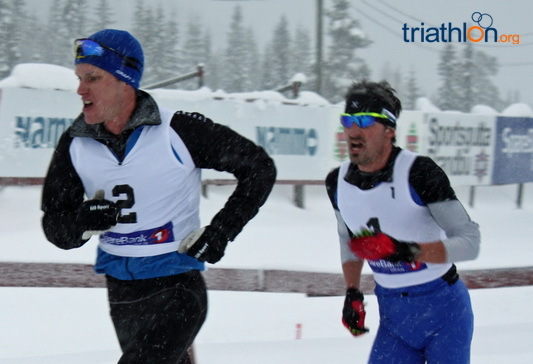 The 2011 Winter Triathlon season kicked off in Norway this past weekend at the Lygna ITU Winter Triathlon European Cup. 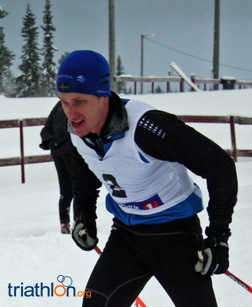 Andreas Svanebo and Hanne Trønnes overcame difficult conditions to prevail in the opening race of the season. 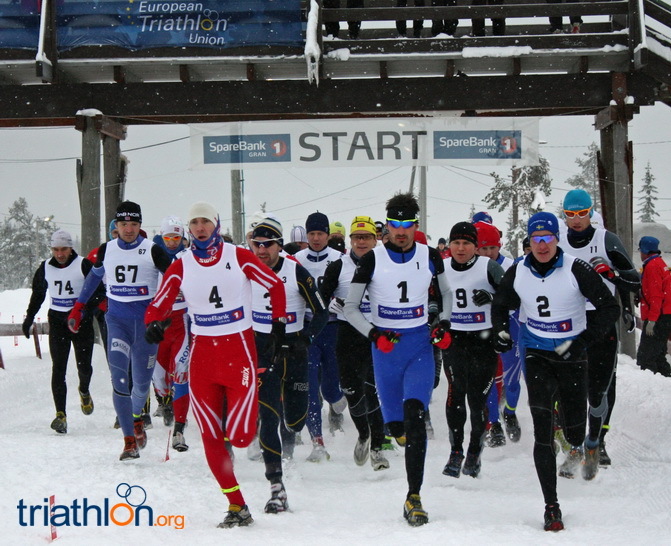 With days of heavy snowfall, event organisers had its crew on the course at 3:30am on race day to clear the fresh snow. 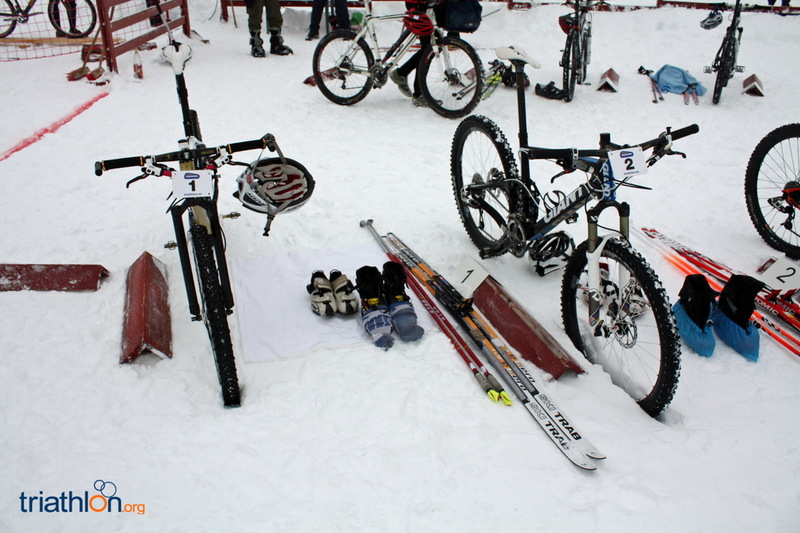 But so much snow fell that Technical Officials decided to shorten the bike portion by one lap to avoid unnecessary exposure to the biting winds sweeping in fresh snow. 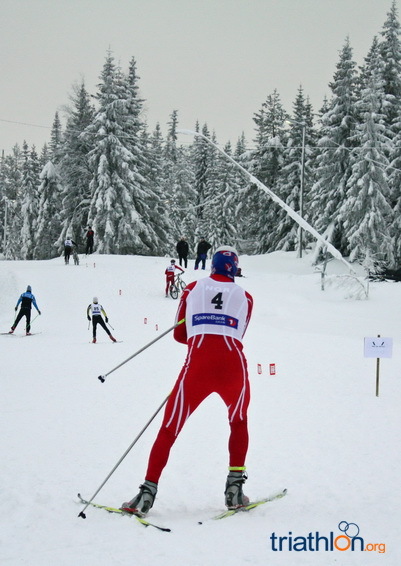 The athletes who all stepped up to the line included European Cup participants, Norwegian National Championship participants and a strong contingent of juniors and youths. 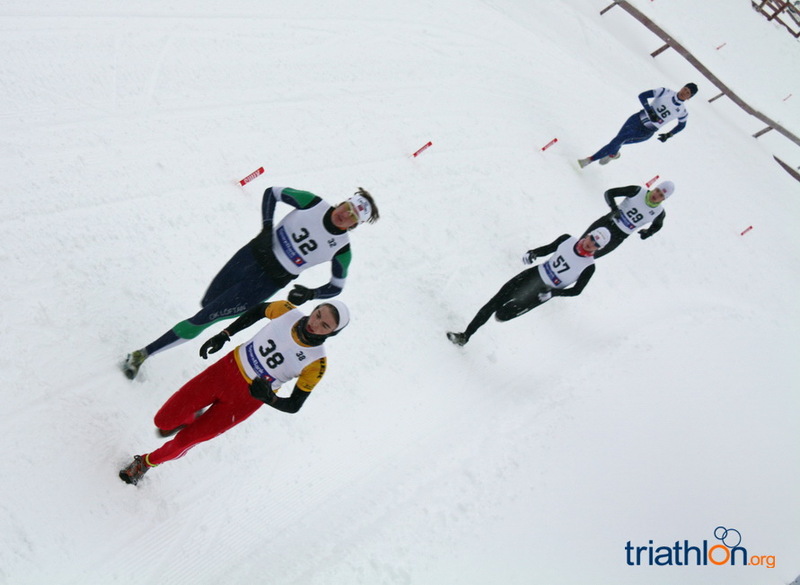 The elite men’s race soon settled into a battle at the front. 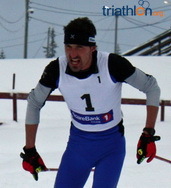 Kristian Monsen of Norway, broke away on the second lap of the run. 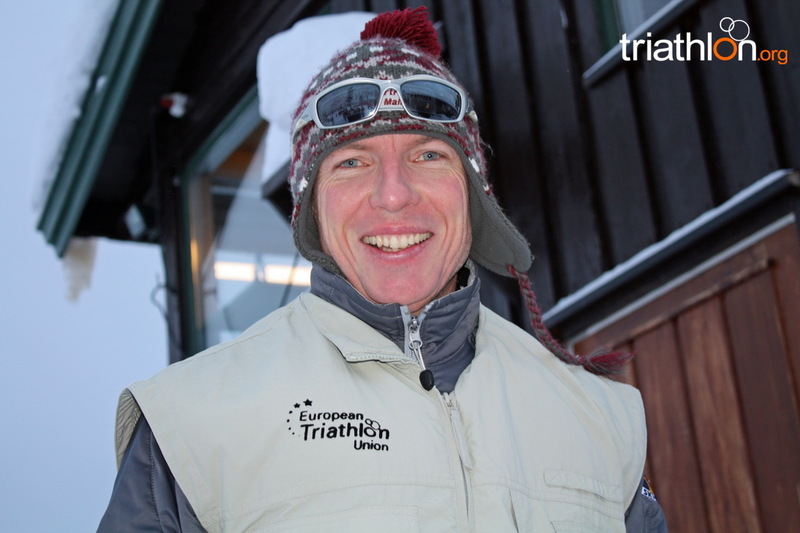 Behind him and knowing only too well that they had considerable power for the bike and ski, were Svanebo and Daniel Antonioli. 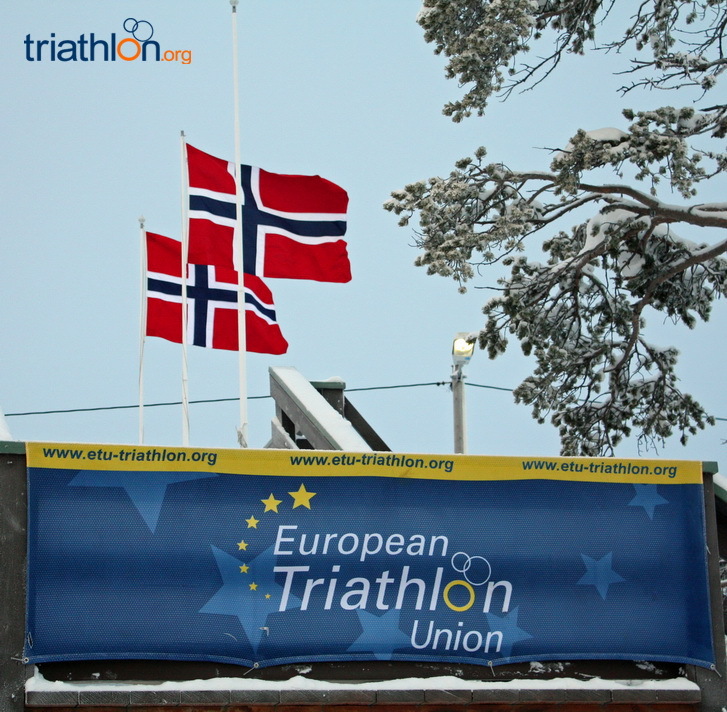 Antonioli races with or without snow as his performance in Edinburgh at the Duathlon World Championships showed and with a fifth place at last year’s World Championships in Eidsvoll have shown. 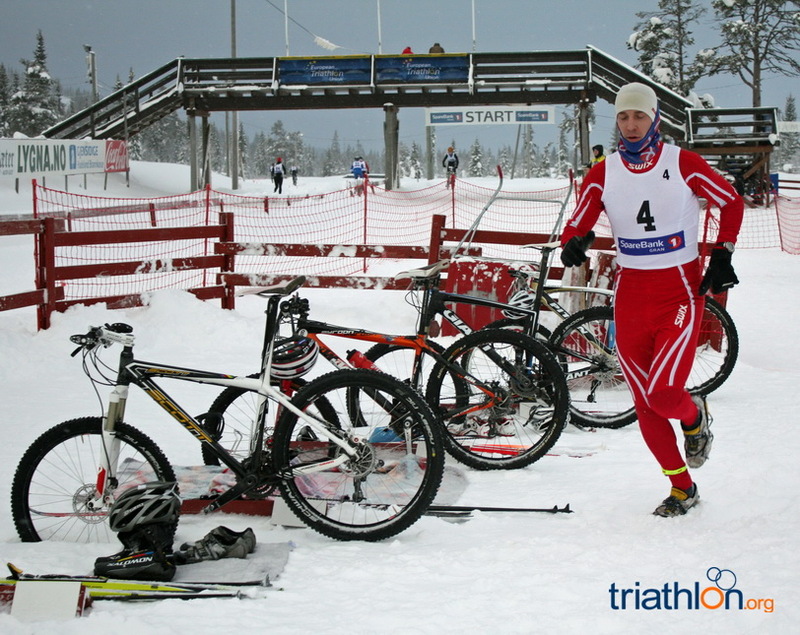 Svanebo and he must have been confident they would catch Monsen on the bike. 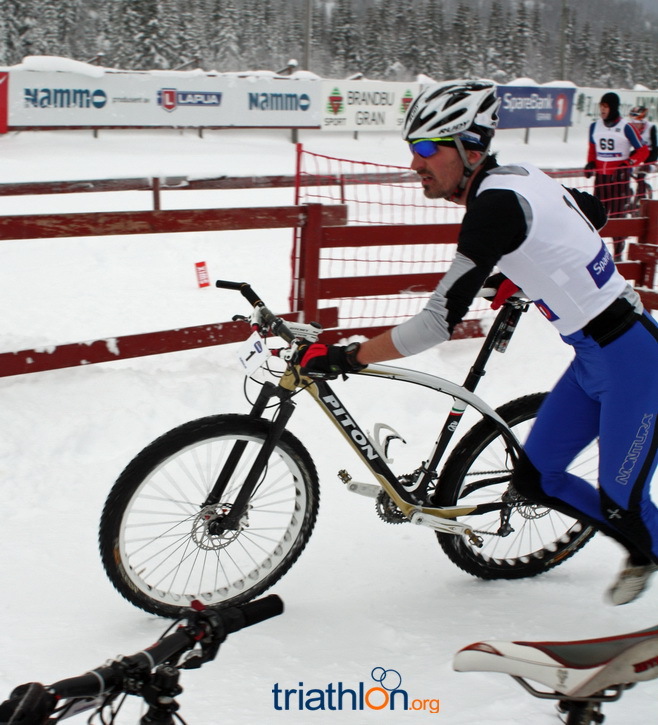 A quick transition from Monsen took him out onto the bike course. 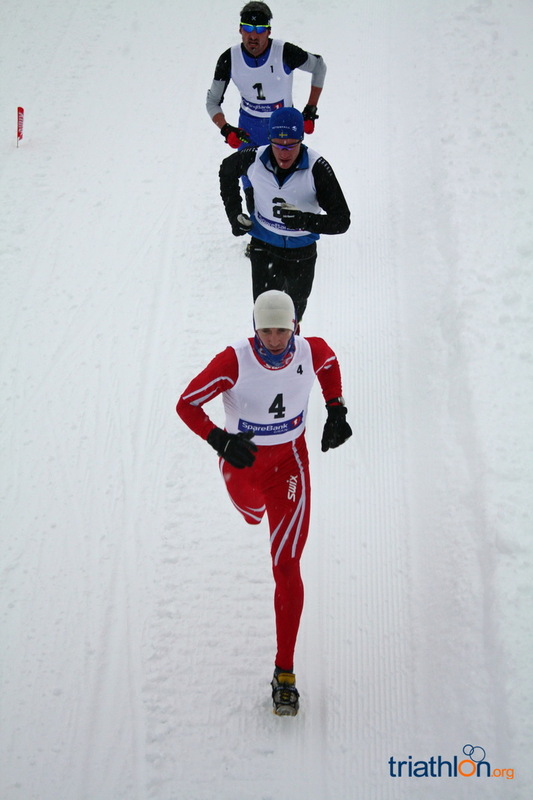 Svanebo and Antonioli were not far behind and by the end of the first lap, they had caught and overtaken Monsen. 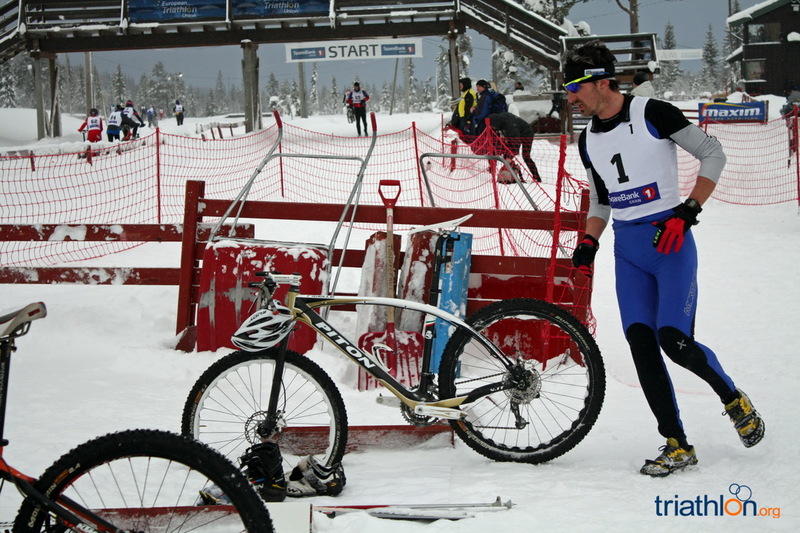 The conditions were getting tougher and it was after the leading Elite Men had completed the third of a planned five laps that all athletes were advised the bike course was reduced to 4 laps. 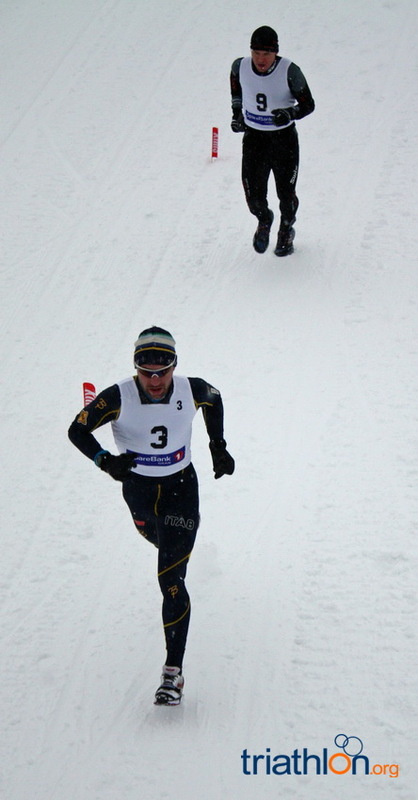 Antonioli was leading Svanebo by approximately 50 seconds and the fans were wondering if the Swedish World Champion Svanebo was on the verge of being upset. 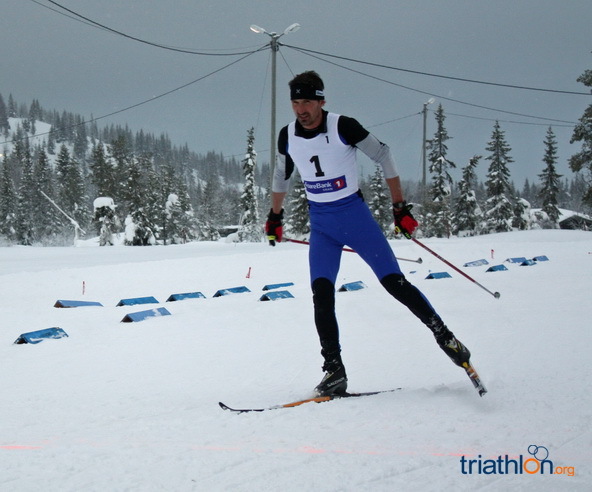 Out onto the ski section, Svanebo was cutting into Antonioli’s lead, buoyed by the tremendous support around the course. 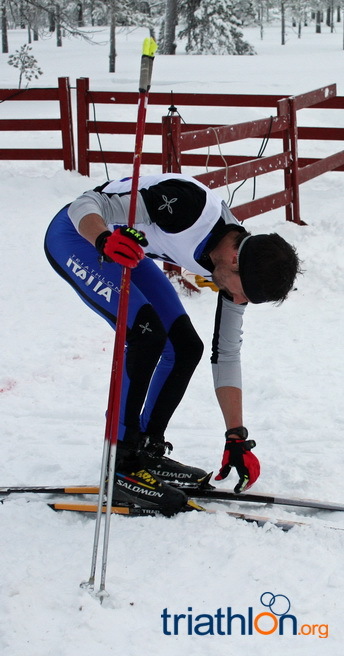 On the final lap, he swept past the Italian to cross the line 17 seconds in front. 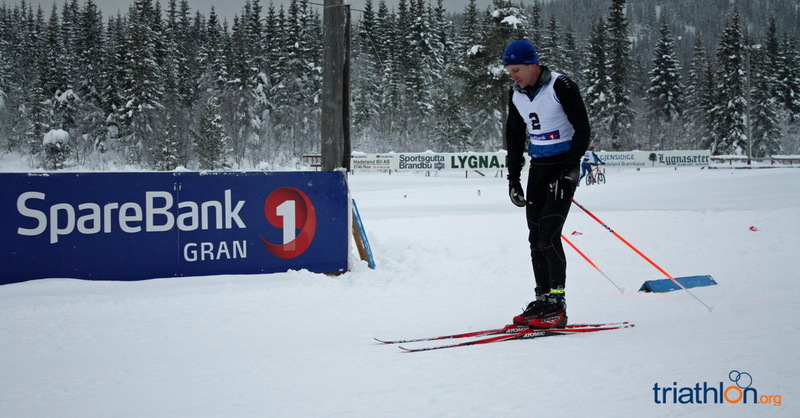 Monsen dug in and claimed a well deserved third place beating the silver medallist from Eidsvoll by a convincing margin. 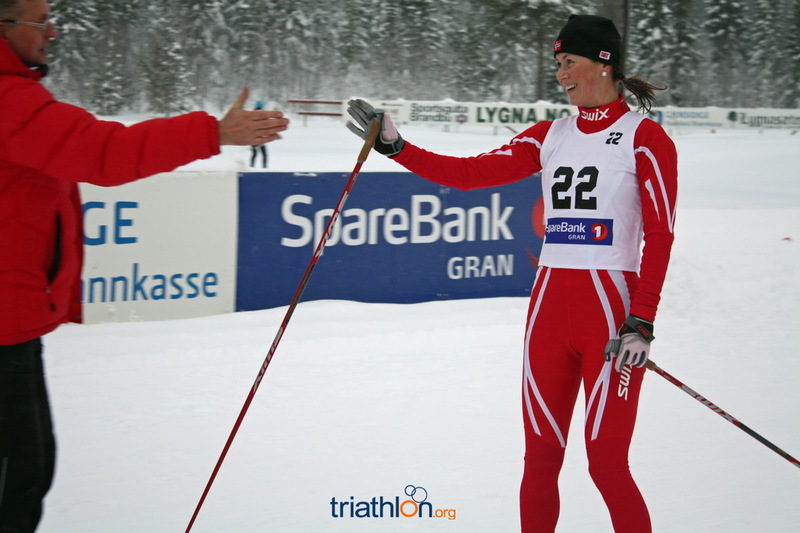 On the women’s side, Hanne Trønnes had it all to lose and losing was not in her plans. 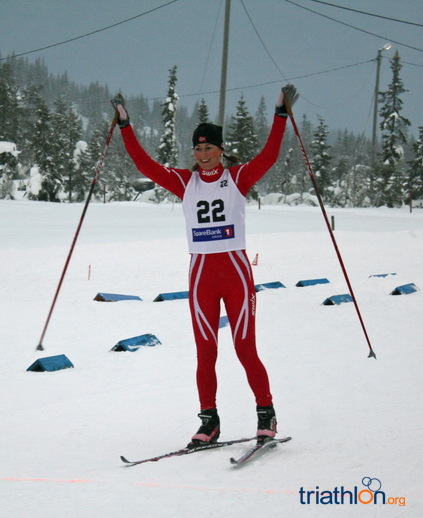 She was in good form and looking to remind all the other Norwegian participants that she was out to make her mark. 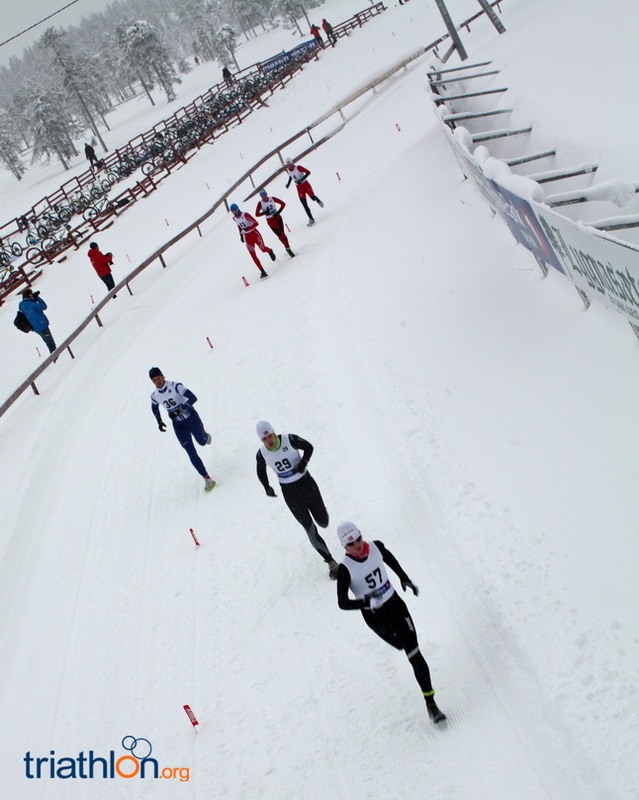 But from the gun she had a hard job as Brita Mustad gradually broke away and used the three 2km laps to establish a 45-second lead on the course that had been chewed up by the men’s race. 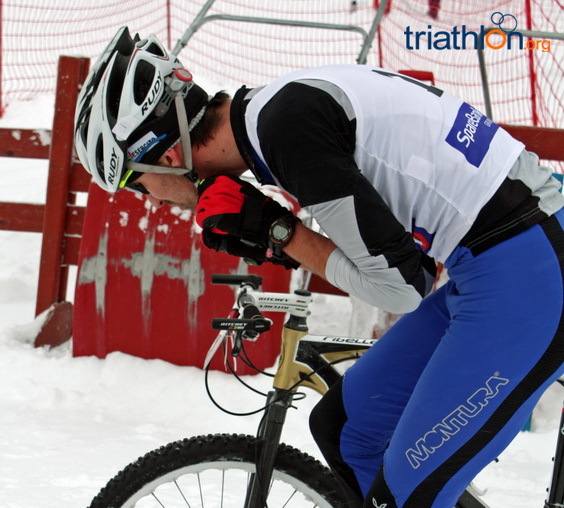 It made it a very hard day at the office for anyone who was not in front. 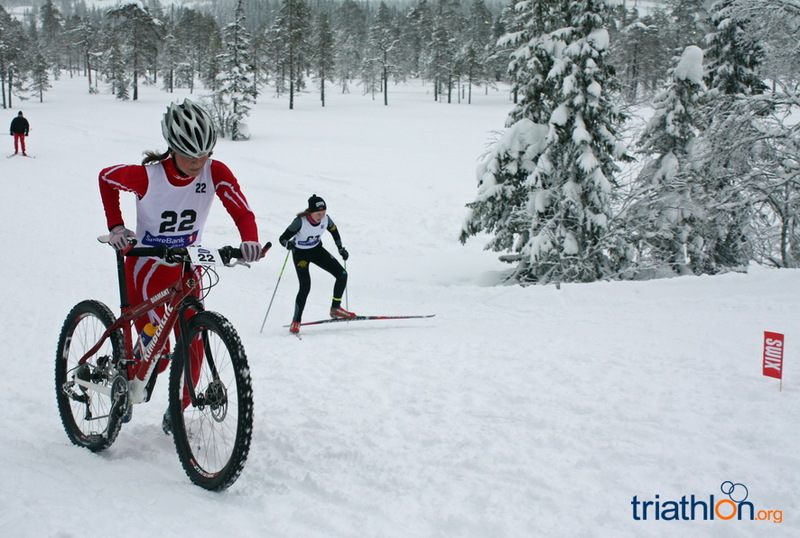 Mustad was swift through transition but behind her was a powerful Trønnes. 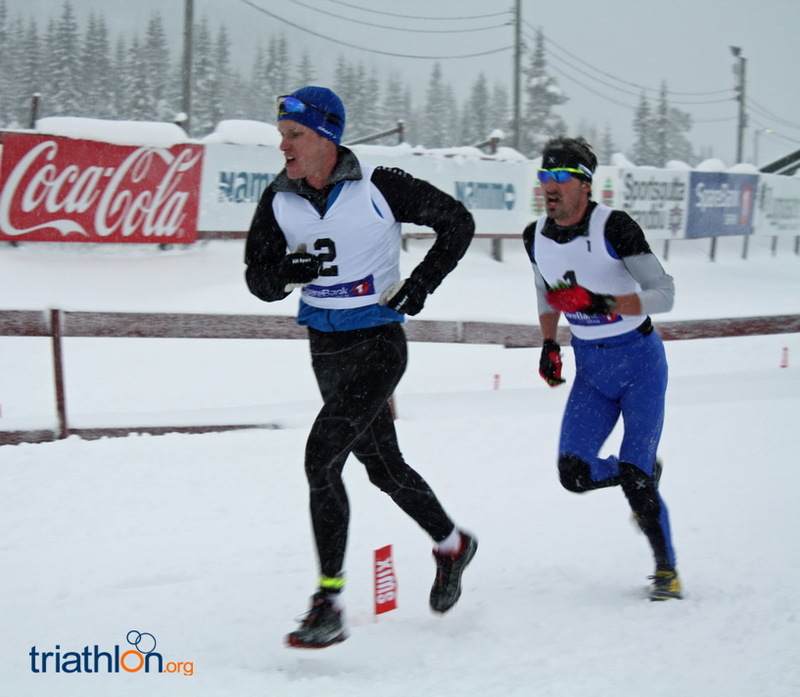 The snow conditions worsened and as the winds swept down the valley, more snow blew onto the course. 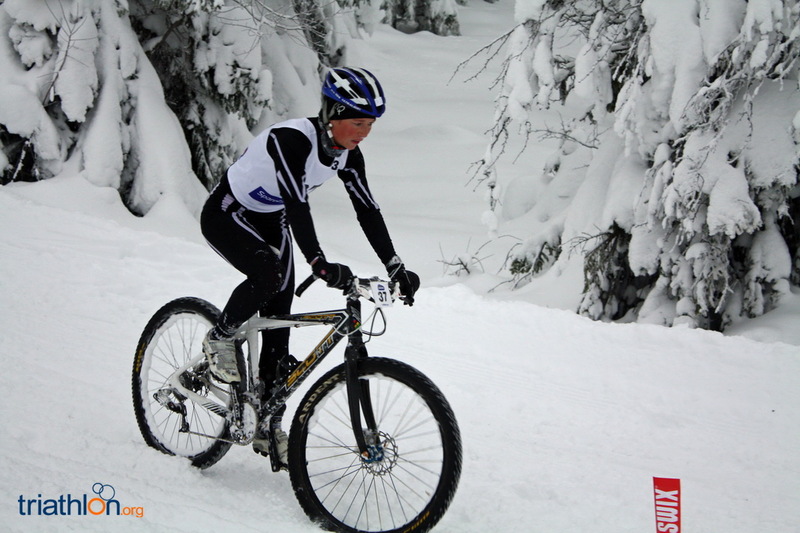 Trønnes’ biking strength allowed her to pass Mustad and by the end of the bike, she had built a three minute lead. 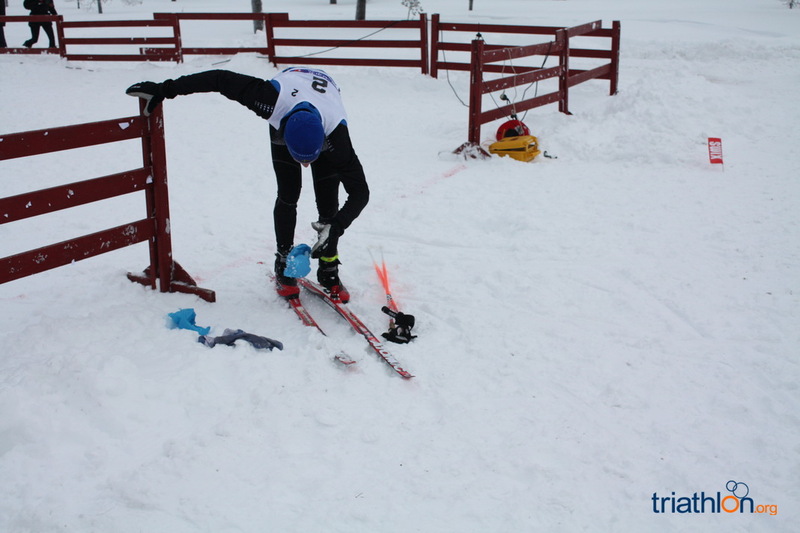 Once out on the ski section she cruised around the tough hilly course to take a convincing victory. 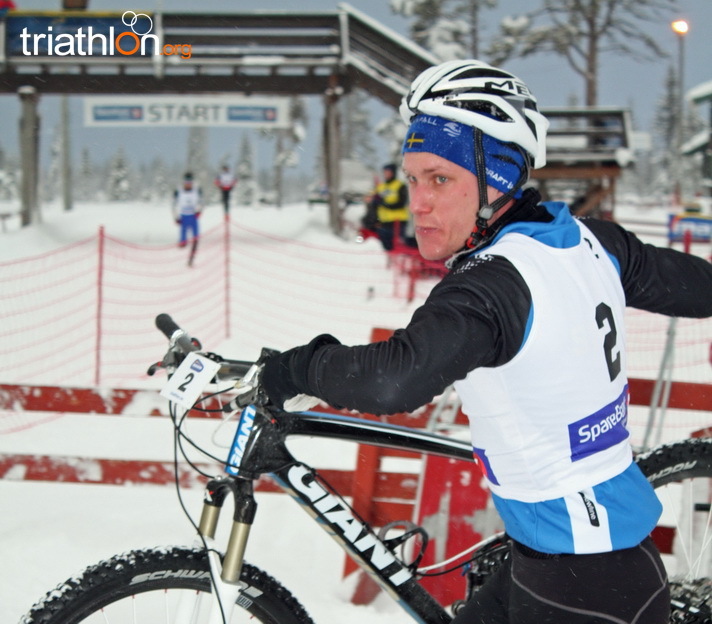 Behind her, battling against the other athletes was Mustad who was all too aware that within this race were Norwegian athletes hoping to get National Championship status. 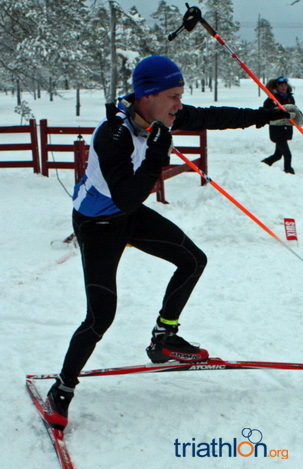 Mustad hung on and crossed the line in second place while Frida Bustad finished third. 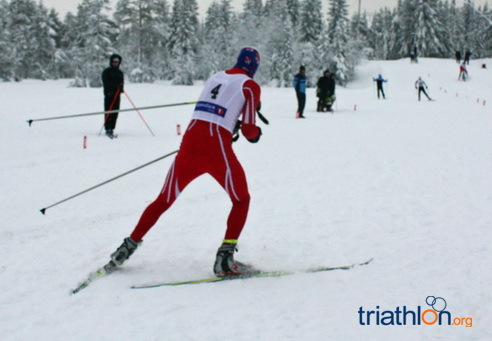 Located 80km north of Oslo, Lygna is a hidden gem for winter-sport enthusiasts. 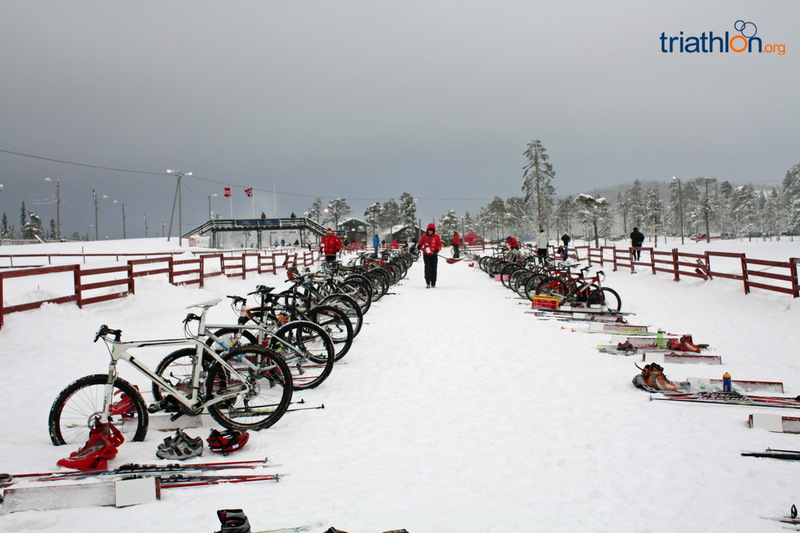 The area is 650m above sea level and delightfully free of traffic. 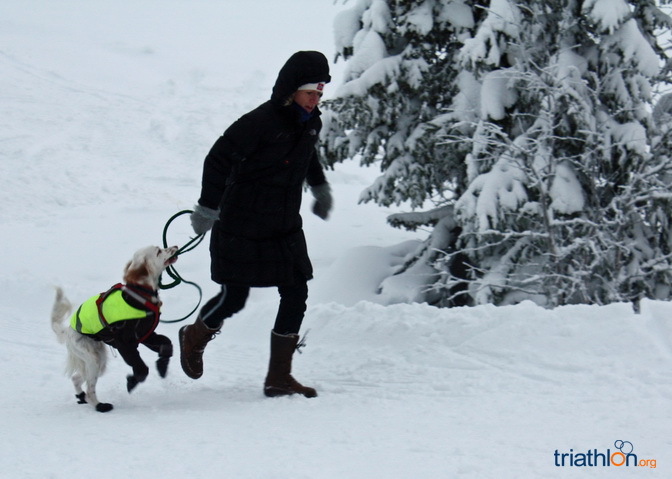 Snowfall is regular from November until late spring. 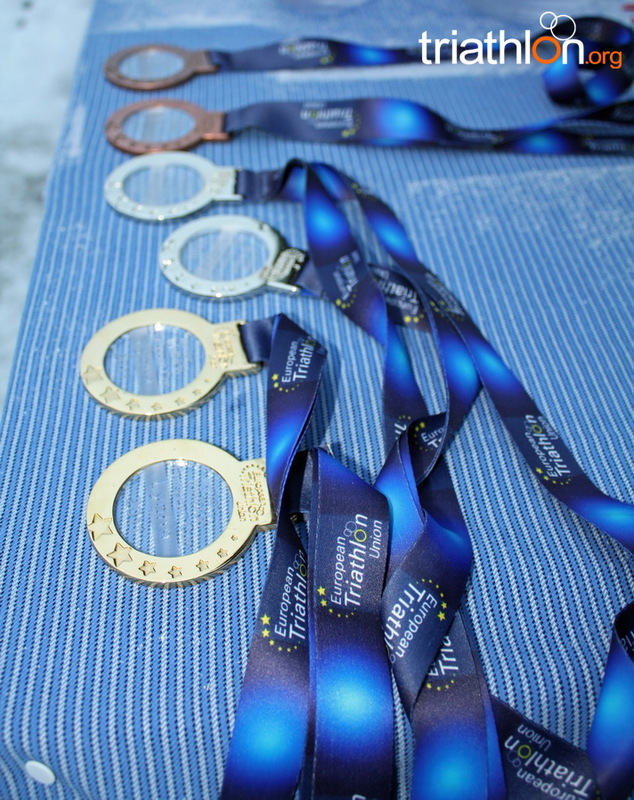 Philip Schaedler, President of the European Triathlon Union, presented the medals and wished all the athletes the best for the remainder of the season.